Shirts With Random Triangles: Oregon Announces Installation Of LED-Covered Football Field Inside Autzen Stadium For April Fools Day. 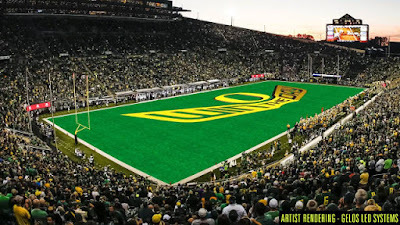 Oregon Announces Installation Of LED-Covered Football Field Inside Autzen Stadium For April Fools Day. Oregon is taking the tired April Fools Day meme of colleges going all Boise State with their football fields in a whole new direction. The school has "announced" that it's installing the first ever LED football field in Autzen Stadium, and it will be ready to go for the 2016 season. Okay, Oregon gets a little scoreboard for actually evolving a meme, but let's not give the school too much props for a stunt like this.